The city of Beppu is located on the east coast of Kyushu Island and it lies at the base of a slope of volcanic debris. In and around this city in northeastern Kyushu are more than 3800 hot springs, geysers and fumaroles (vents emitting gases and steam). It has the largest volume of hot water in the world aside from Yellowstone and the largest number of hot spring sources in Japan. 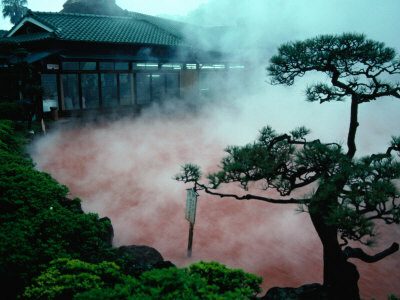 Hot springs are regarded as sacred. The waters are sparkling, hot, mineral-rich and multicolored. Regional folklore and contemporary visitors report that the waters work wonders on both body and spirit. Because of the legendary therapeutic powers of its myriad springs, Beppu attracts over 12 million Japanese and foreign visitors each year. 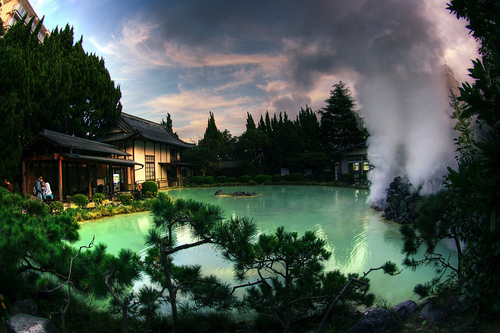 Beppu contains 9 major geothermal hot spots, which are sometimes referred to as the - nine hells of Beppu. 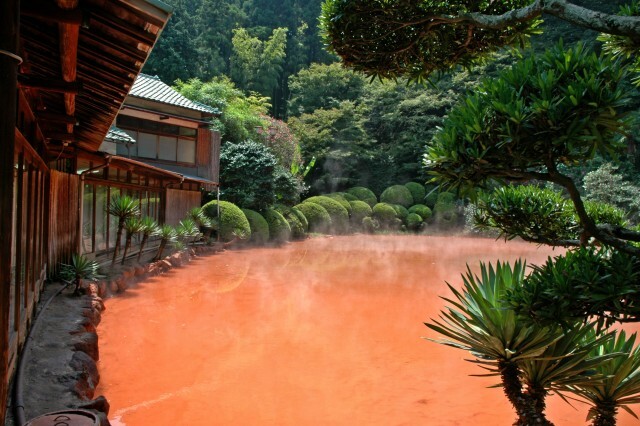 Hot spring ponds for viewing are called jigoku, literally meaning hell, because of their resemblance to the Buddist conceptions of hell. Famous hells include the Sea Hell because the boiling water of the pond is blue, and the Blood Pond Hell where red mud is emerging with boiling water. There are an incredible variety of springs to choose from: huge, multi-pooled complexes operated by the resort hotels; small, family-run onsens (the Japanese word for hot spring) whose soaking pools are hundreds of years old and beautifully lined with wood and stone; great outdoor pools of bubbling blue and red mud; and great earthen cauldrons of steaming sand called Sunayu. Sunayu is hundreds of years old and has been managed by the same family for its entire history. Walking through charming little town Beppu, you can see the steam rising from cracks in the sidewalks, sewer vents and half-pipes. Leave it to the Japanese to have cleverly harvested it's power by turning potentially dangerous cravats of heat to stellar onsens where one can get anything from a therapeutic sand bath to a steam inhaling session. 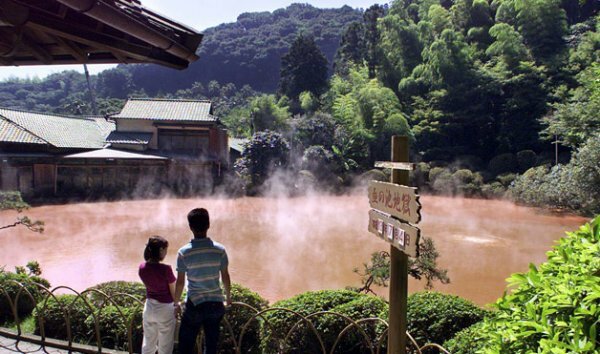 Beppu uses geothermal water to heat buildings and factories. Another attraction is the (literally "Secret Treasure Hall"), with displays of erotica mostly from Japan, India, Tibet and Paua New Guinea. At the edge of the city, Beppu also has an aquarium featuring dolphins at the base of Takasaki-yama (mt. Takasaki), which is known for its large population of wild monkeys (macaques). 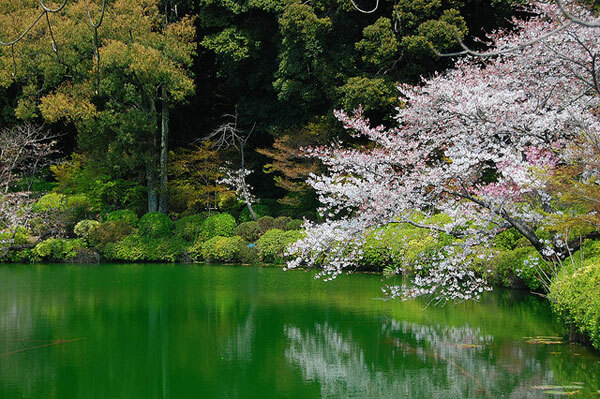 A 15-minute bus ride from Beppu Station there is Suginoi Palace, an amusement center with one of the best-known baths in all of Japan. Called Tanayu and built of natural woods and glass, it's refined and spacious, with different kinds of baths both inside and out that take advantage of its hillside perch with great views out over the town toward the sea. 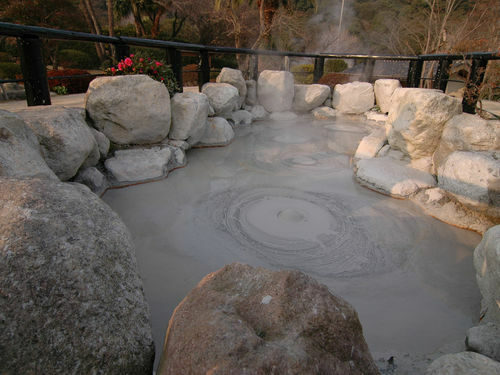 One of the unique things you can do in Beppu is take a bath in hot sand, considered useful for treating muscle pain, arthritis, and indigestion. Although several public baths offer hot-sand baths, one of the most atmospheric places is the Takegawara Bathhouse. There is a power to this place which makes a wonderfully invigorating and mind altering experience.